Nana Biluš Abaffy and her partners in choreographic co-fabulation, Milo Love and Geoffrey Watson, present an expanded hour-long version of Post Reality Vision, one of the finalists at last year’s Keir Choreographic Awards. It’s a show that sits somewhere between satire and earnest commentary, a parody of the perversions of surveillance culture and also a lament for the dissolution of the physical being in contemporary art practice. It’s a meditation on perspective and habits of seeing, and a playful critique of the proliferation of virtual realms. It’s a wry comment on our culture of instantaneous reproduction. And it’s a comic but nonetheless sincere attempt by the performers to reclaim autonomy over their own objectification. It’s all these things. Perhaps. Or perhaps none of them. Or just some of them. It’s hard to say because, above all, Post Reality Vision is a show full of trickery and teasing concealment where it’s never clear just what is intended and what’s unintended, what is real and what is imagined. A photographer’s studio and a printer’s workshop have collided. The Sylvia Staehli stage at Dancehouse is crowded with dozens of studio lights. There are digital cameras on tripods. One of them is hooked up to a large screen television. Another smaller television hangs in a downstage corner. Unused Fresnel lanterns are scattered at the front of the stage. There’s a Polaroid camera. There are large boxes and frames and accumulations of rubbish. And everywhere there are photographs of the performers, all of them nudes. There must be nearly a hundred full-colour cut-outs on stage, pictures of all sizes. Some are mounted and hang from the ceiling. Others lean against the walls. Some are on the floor. Some are draped across the photographic equipment. The video cameras reproduce these reproductions. Then other cameras reproduce those images. The show hasn’t yet started yet but already the stage has been swallowed in a virtual loop, consumed and reconstituted through the electronic gaze. Biluš Abaffy edges sidelong onto the stage, taking small steps while clasping a papier-mâché cast to her buttocks. In this hobbling fashion she makes her way downstage, slowly negotiating the clutter of lights and cameras and screens and cut-outs. Eventually, she prises off the cast. A triumph! A revelation! But what is revealed? Is it the buttocks or the impression that we are invited to admire? It’s the buttocks, apparently. The cast ends up in a bin placed at the edge of the stage. What should we make of this? Clearly there is some play on representation and replication. But more than that we should understand that the back of a thing is essential. It’s other end that matters. Indeed, the desire to see things from behind is a reoccurring motif in the work of Biluš Abaffy and her crew. Think, for instance, of those video cameras. We are invited to see the action through the back of the machine. And to observe the back of a camera operator hovering at the margins of the stage, drawn into the layers of representation. Later, Biluš Abaffy trots off stage, disappearing behind the audience. What is behind? What is behind us? She returns with a large poster, another life-sized photograph of Watson and Love. In the picture, they are holding the pose which, at that moment, they are struggling to hold on stage. Biluš Abaffy inelegantly manoeuvrers the poster onto the tarkett and slowly edges it in front of the two live bodies, obscuring them. As she is doing this, we glimpse the back of the poster. It is covered in scrawled notes and images pinned up in a grid pattern. It looks like a storyboard. Something about the show is revealed on the other side of this poster; but we cannot see it properly. On the back of the large television screen at the centre of the stage, we glimpse a classical painting. It is a reproduction of Michelangelo’s “Separation of Light from Darkness“. Could this be a reference for all these classical poses the three performers are imitating? Yes, we soon realise that the oversized photograph of Milo Love hanging from the ceiling is an imitation of Michelangelo’s God as he manipulates the elements. Is this back-to-front logic a critique of the relentless frontal aspect of the theatrical space? Indeed, is it a critique not just of the theatre and the televisual screen but of the whole age of the world picture? That it has no fundament? This is kind of funny, right? All this business about fundaments and a posterior reality? And the show is funny in an awkward slapstick way. The performers mumble or shout. Look about in confusion as if they weren’t sure what to do next. They threaten to knock things over as they pick their way gingerly across the overcrowded stage. And there are moments of comic delicacy, too. Biluš Abaffy is so light on her feet. And her gestures have a kind of exaggerated expressivity. An ironic intensity. At one point, she springs off the stage and snatches a pair of heavy new work boots, which still have a tag attached, from under a seat in the audience. Wearing only the boots, she leaps and stamps and twists across the stage. Actually, she isn’t only wearing books. There’s also a thing wisp of material stuck to her chest with PVA. Milo Love, too, wears only an unbuttoned blouse. And Geoffrey Watson – who is a costume designer – has no costume. Why boots? The pay-off comes much later. We’re told that Michelangelo had a habit of sleeping in his boots while working on major commissions like his statue for Pope Julius II. There’s a picture of those boots, a representation, in Raphael’s “School of Athens“. Watson hops nervously between tasks, filling spare moments with balletic affectations. Love, on the other hand, stalks purposefully from one assignment to the next, from one glamour photo shoot to another. There are lulls. You wait for something to happen. The conceptual rigour is counterpointed by dramaturgical flaccidity. This is part of the humour, yes, but is it also the whole point of the show? Is dramaturgical flaccidity the dramaturgical method? Perhaps one reason Post Reality Vision can seem unfocused compared with other contemporary dance performances is the absence of non-diegetic sound. Indeed, there is no underscore of any sort. And the silences are awkward because it’s one more way in which the performers are naked. Some people find theatre excruciating because it’s not television. Because there is a direct connection with a real person. Take away mechanical elements, like sound design, and the tension created by that connection is intensified. It becomes more excruciating, more demanding. The awkwardness of Post Reality Vision, which is the awkwardness of the naked body when it emerges from behind its beautified representations, is provocative. And if we feel uncomfortable, is that because we’ve felt, however fleetingly, an unmediated presence? A body with a back end? It makes you wonder about torture. Post Reality Vision is a kind of torture. Or, if that’s too strong, it is at least a work in dialogue with discomfort. Biluš Abaffy snaps a picture of Milo Love with the Polaroid. They wait for the image to develop. “This is torture,” murmurs Love. Later she tells us that Michelangelo developed a crooked spine from painting the Sistine Chapel ceiling, lying on his back for five hours a day. Do we register that pain when we look at a reproduction of “The Creation of Adam”? Michelangelo seems to be the presiding genius of this show. According to the program, the work was inspired by Biluš Abaffy’s discovery that only known self-portrait of Michelangelo is the face he painted on the flayed skin of St Bartholomew in his sprawling altar wall depiction of the Last Judgement. As if referencing this disturbing fact, there is a cut-out photograph draped over the centre-stage television which sometimes, at least to my eye, resembles a flayed skin hanging between us and the dancing pixels of the post reality image. I wonder about the premise of this show. The idea announced in the program is that the body confronts the unreality – the post reality – that we create with smart phones and cameras and the rest. In a world of screen experiences perhaps the body does guarantee reality, but what about the future? What about when the body itself begins to merge with the technology which produces this world of staring objects? This might be a tediously undergraduate question, but aren’t we entering an era of trans-reality vision rather than post reality vision? And in a world of trans-reality experiences, will the body qua body still exist? I recall that there was a scene – perhaps the final scene – in the shorter Kier Choreographic Awards version of this show where Nana Biluš Abaffy leaned into the television, the image of her face trailing downward in an infinite recursion. At that moment her body seemed to fuse with the screen, unifying with its future, gesturing toward the singularity. There is no such moment in this new version. Here, the conclusion feels arbitrary. It feels disconnected from what is to come, more interested in what has been. We shall take the body, and we shall extract as much information out of it as we can – with cutting-edge technology it is now possible to 3d print our own bodies so that we can observe and dissect them from an objective distance. We shall learn from them – the body will tell us how things are, or how they ought to be. We’ll next 3d print our thoughts (WE HAVE TO MOVE QUICK). They’ll appear small, no larger than the average-sized skull, and very condensed, so we will need magnifying glasses and detailed charts. Why? Well because it’s difficult, edging on impossible, to speak with any amount of precision about what the body, which includes the brain, whose pictorial impressions we have 3d printed above, knows. Well. That, I think, clears up the problem of art form classification. And speaking of brains. 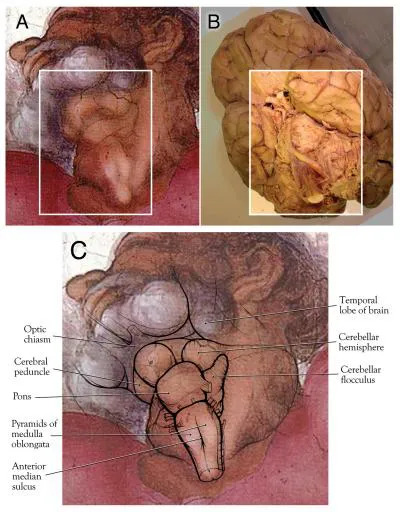 Did you know that there are actual doctors who believe the depiction of God in Michelangelo’s “Separation of Light from Darkness” contains an anatomically correct image of the human brain? It’s caught in his throat! And not just the brain but the whole visual system, including optic nerves and eyeballs. Who knows what thoughts are printed in the impasto textures of Michelangelo’s painted brain? What dreams we might recover? So this is what it is. The virtual has invaded the real. What we see here is a kind of staged counter-insurgency. Post Reality Vision proposes an assault against the palaces of representation and a disruption of the mediated gaze. The corporeal is asserted in all its awkwardness, though it remains far from clear whether or not the assault can be sustained. Post Reality Vision, choreography by Nana Biluš Abaffy, performed by Nana Biluš Abaffy, Milo Love, Geoffrey Watson. Technical design by Meri Leeworthy. Presented by Dancehouse as part of Dance Massive until Saturday Mar 16. Bookings.